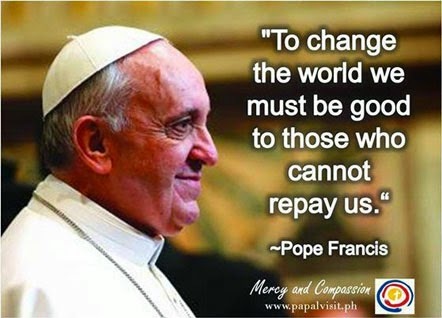 Malacanang declares January 15, 16 & 19, 2015 as special non-working days in NCR for Pope Francis visit - Balita Boss! Paquito N. Ochoa Jr., Executive Secretary, by authority of President Benigno 'PNoy' Aquino III, has declared January 15, 16 and 19, 2015 as special (non-working) days in the National Capital Region (NCR) for the visit of Pope Francis, the reigning pope of the Catholic Church and the Head of State of the Vatican City. The declaration was made through Proclamation 936, issued by Malacanang on December 22, 2014. Manila Mayor Joseph Estrada declared a five-day holiday in government offices and suspended classes in all levels during the visit of Pope Francis. The holiday declaration during the papal visit was proposed to enable Catholics to take part in the activities and to avoid the buildup of heavy traffic. A papal holiday was also declared when the late Pope John Paul II went to Manila in 1995 for the World Youth Day, which drew some five million people. In view of the visit of the Pope, the Head of State of the Vatican City, I, PAQUITO N. OCHOA JR., Executive Secretary, by authority of His Excellency, BENIGNO S. AQUINO III, do hereby declare January 15, 16 and 19, 2015, as special (non-working) days in the National Capital Region (NCR). Done in the City of Manila, this 22nd day of December, in the year of Our Lord, Two Thousand and Fourteen. (Sgd.) PAQUITO N. OCHOA JR.